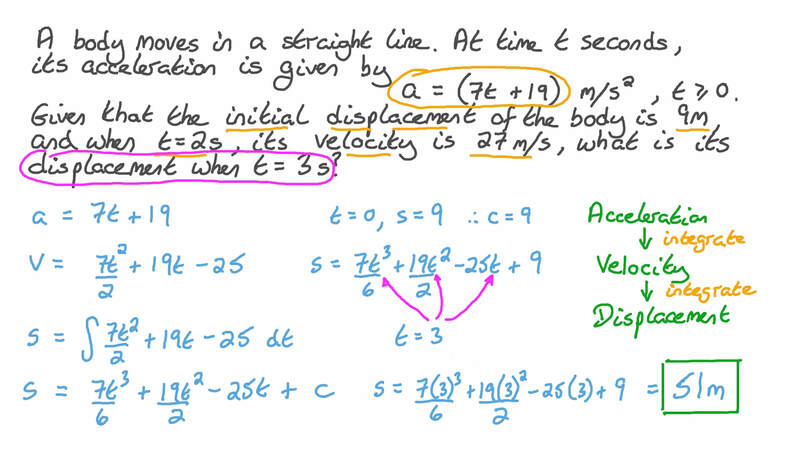 In this lesson, we will learn how to find the velocity and displacement using definite integration. A particle is moving in a straight line such that its speed at time 𝑡 seconds is given by Given that its initial position 𝑟 = 1 6 0 m , find its position when 𝑡 = 3 s e c o n d s .
A particle started moving in a straight line from the origin such that its acceleration at time 𝑡 seconds is given by Given that its initial velocity was 14 m/s, determine its velocity 𝑣 and its displacement 𝑠 when 𝑡 = 2 s e c o n d s .
The diagram below shows the acceleration of a particle which was initially at rest. What was its velocity at 𝑡 = 7 s ? The acceleration-time graph of a particle which was initially at rest is shown below. What was its velocity at 𝑡 = 1 1 s ? A particle is moving in a straight line such that its velocity at time 𝑡 seconds is given by Given that its initial position 𝑟 = 1 3 0 m , find an expression for its position at time 𝑡 seconds. A particle started moving in a straight line from point towards point . Its velocity after seconds is given by After 2 seconds, another particle started moving in a straight line from point towards point . This particle was accelerating at 0.9 m/s2. The two particles collided 6 seconds after the first particle started moving. Find the distance . A particle is moving in a straight line such that its velocity at time 𝑡 seconds is given by Given that when 𝑡 = 𝜋 2 seconds its position from a fixed point is 𝑟 = 2 0 3 m , find an expression for 𝑟 in terms of 𝑡 . A particle started moving in a straight line. Its acceleration at time 𝑡 seconds is given by Find the maximum velocity of the particle 𝑣 m a x and the distance 𝑥 it travelled before it attained this velocity. A particle started moving from rest along the 𝑥 -axis from a point at 𝑥 = 1 0 m . Its acceleration at time 𝑡 seconds is given by Express its velocity 𝑣 and its displacement 𝑥 after time 𝑡 seconds. A particle, starting from rest, began moving in a straight line. Its acceleration 𝑎 , measured in metres per second, and the distance 𝑥 from its starting point, measured in metres, satisfy the following equation 𝑎 = 𝑥 1 5 2 . Find the speed 𝑣 of the particle when 𝑥 = 1 1 m .
A particle is moving in a straight line such that its acceleration at time 𝑡 seconds is given by Given that its initial velocity is 1 2 1 3 m/s and its initial position from a fixed point is 7 1 0 m, determine its position when 𝑡 = 2 𝜋 seconds. The figure shows a velocity-time graph for a particle moving in a straight line. Find the magnitude of the displacement of the particle. A particle is moving in a straight line such that its velocity after 𝑡 seconds is given by Find the distance covered during the time interval between 𝑡 = 0 s and 𝑡 = 1 2 s .
The acceleration of a particle moving in a straight line, at time 𝑡 seconds, is given by When 𝑡 > 1 3 , the particle moves with uniform velocity 𝑣 . 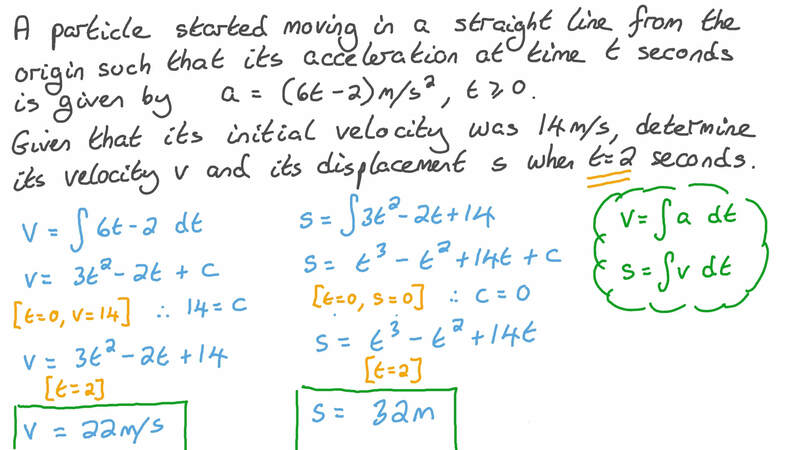 Determine the velocity 𝑣 and the distance, 𝑑 , covered by the particle in the first 23 s of motion. A body started moving along the 𝑥 -axis from the origin at an initial speed of 10 m/s. When it was 𝑠 meters away from the origin and moving at 𝑣 m/s, its acceleration was ( 4 5 𝑒 ) − 𝑠 m/s2 in the direction of increasing 𝑥 . Determine 𝑠 when 𝑣 = 1 1 / m s .
A body moves in a straight line. At time 𝑡 seconds, its acceleration is given by Given that the initial displacement of the body is 9 m, and when 𝑡 = 2 s , its velocity is 27 m/s, what is its displacement when 𝑡 = 3 s ? A particle is moving in a straight line such that its acceleration, 𝑎 metres per second squared, and displacement, 𝑥 metres, satisfy the equation 𝑎 = 2 6 𝑒 − 𝑥 . Given that the particle's velocity was 12 m/s when its displacement was 0 m, find an expression for 𝑣 2 in terms of 𝑥 , and determine the speed 𝑣 m a x that the particle approaches as its displacement increases. A particle moves in a straight line. At time 𝑡 seconds, its velocity, in meters per second, is given by What is its displacement in the interval 0 ≤ 𝑡 ≤ 𝜋 2 s e c o n d s ? A particle started moving in a straight line such that its acceleration, measured in metres per second, and its displacement from a fixed point, measured in metres, satisfy the following equation: 𝑎 = 𝑥 − 6 . Given that its initial displacement from the fixed point was 9 metres and its initial velocity was 5 m/s, determine its velocity when 𝑎 = 0 . A particle moves along the 𝑥 axis. It is initially at rest at the origin. At time 𝑡 seconds, the particle’s acceleration is given by How long does it take for the particle to return to the origin? BThe particle will never return to the origin. A particle started moving from a fixed point in a straight line such that its acceleration 𝑎 , measured in metres per second squared, and its position 𝑥 , measured in metres, satisfy the following equation: 𝑎 = 2 𝑥 + 2 4 . Given that the initial velocity of the particle was 2 m/s, find an expression for 𝑣 2 in terms of 𝑥 . A particle starts from rest and moves in a straight line. 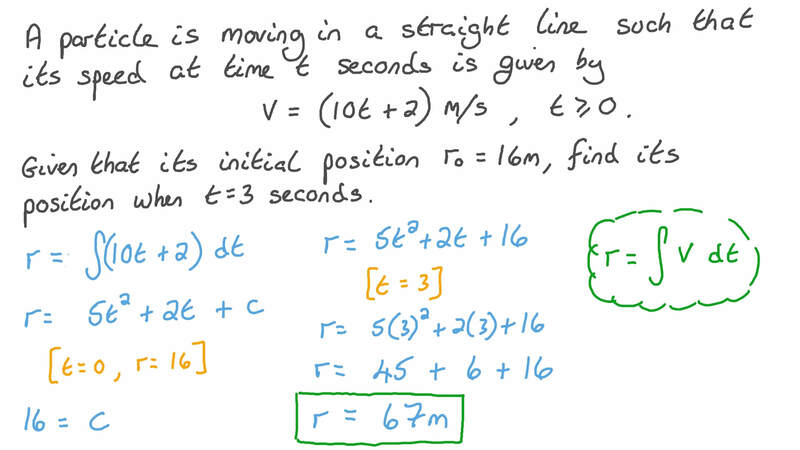 At time 𝑡 seconds, its velocity is given by How long does it take for the particle to return to its starting point? The given acceleration-time graph represents the motion of a particle. Given that the particle moved in a straight line and was at rest at time 𝑡 = 0 s , find the velocity of the particle at 𝑡 = 1 2 s .
A particle started moving on the 𝑥 -axis from the origin 𝑂 at an initial velocity 𝑣 0 . At time 𝑡 seconds, the particle’s acceleration is given by Given that after 6 seconds, the particle’s displacement was 75 m in the right from point 𝑂 , Determine 𝑣 0 . If the body passed by 𝑂 once again, determine its velocity 𝑣 at this moment. Two bodies, initially at rest at the same point, start to move in the same direction along the same straight line. At time 𝑡 seconds ( 𝑡 ≥ 0 ) , their velocities are given by 𝑣 = ( 2 3 𝑡 − 5 8 8 ) / 1 c m s and 𝑣 =  3 𝑡 − 6 1 𝑡  / 2 2 c m s . Determine the time taken for the two bodies to be 2 744 cm apart.